As the year draws to a close, and the holiday season approaches, our thoughts turn gratefully to those who have made our progress this year possible. 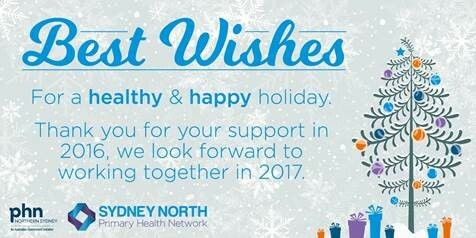 It is in this spirit we say simply but sincerely to all our partners, stakeholders and colleagues who have all contributed to make 2016 a tremendous year for Sydney North Health Network, thank you and best wishes for the holiday season. 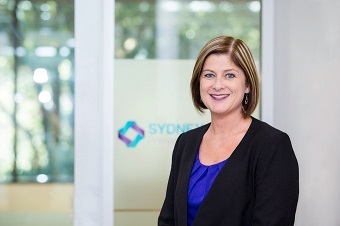 Clinical Council and Community Council: have provided input into the prioritising of PHN workplans, establishing Health Pathways, quality improvement initiatives, and establishing a Sydney North Person Centred Care Model for roll out over the next 12 months. Quality Improvement Initiatives: Incentivising data quality improvement in general practice to support team based care and focusing on improving childhood immunisations & vaccine preventable conditions. Supporting translational research in practices, such as iSOLVE, which is engaging a whole of primary care approach to falls prevention, from assessment to referral pathways and support for evidence based interventions. Building Capacity: Providing ongoing practice support and working with interested practices on introducing the “building blocks” to high performing primary care and strengthening the principles of person centred care within the network. Areas identified of focus are engaged leadership, team-based care, patient-team partnership; prompt access and continuity of care. Strategic grants provided in the areas of chronic disease management, mental health, men’s health, older complex patient hospital discharge and GP education. – Commissioned a hospital discharge follow-up service for dementia clients, to facilitate transfer of care back to the community and ensure appropriate services are sourced to reduce the risk of re-admissions and impact on after hours presentations – two service providers commissioned. – Commissioned a social work service to address the social determinants of health and reduce the risk of unplanned hospital presentations – two service providers commissioned. – Supporting the Northern Beaches hospital avoidance team to pilot a ‘sick patient flip chart’ (triage guide) into six Residential Aged Care Facilities for 3 months with a roll out of all facilities in Feb 2017. – Collaborating with Ambulance NSW on a secure messaging project with the Extended Care Paramedics. – Aboriginal and Torres Strait Islander mental health services. HealthPathways: developing HealthPathways around key priority areas, now at 50 joint pathways being localised and finalised. They will be tested in a limited number of practices and then launched in early 2017. Integration: Working collaboratively with partners to impact on preventable hospitalisations e.g. using simulation modelling to prioritise planning for future End of Life Care Needs. Another example is a joint project with Sonic Clinical Services on general practice led chronic disease management. Communications: continual development and advancement of the work we have done, through our website, eNewsletters, and social media channels with around 50,000 website page visits per month, 3,500 eNews subscribers and a social media community of over 750 people. Governance: Continued oversight and strategic input from our Board and subcommittees: Finance, Audit and Risk Management Committee and Clinical Governance Committees. While it is not possible to list all this year’s achievements into one message, you can read more about our work through our 2015/16 Annual Report. Thank you for working with us this year to help to realise our vision: Achieving Together: Better Health, Better Care. I look forward to another progressive year together in 2017.